Born and raised in Southern California, this reporter is so happy to be back in her home state. Arti's curiosity for life and her passion for writing are what fueled her desire to become a reporter. She loves the daily rush and getting to do something different everyday. Arti dabbled with her first major print and broadcasting assignments while she was in graduate school in Chicago. This included reporting for the PBS affiliate. She later got the opportunity to work in Washington, D.C. as a correspondent for 7 CBS affiliates in Montana in 2006. From there, Arti joined WKAG and covered news along the border of Tennessee and Kentucky. Besides news, Arti enjoyed being a big sister for Big Brothers Big Sisters. She was also given the "Key to the City" by the mayor of Clarksville for her commitment to the community. 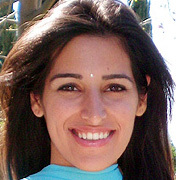 Arti received her BA from UC Berkeley where she completed a major in Mass Communications and a minor in English. She also has a Master of Science in Journalism from Northwestern University's Medill School of Journalism. In her free time, Arti loves to travel, volunteer, write in her journal, and spend time with her family.